Matalan Shoes Size 5. Condition is Used, but hardly worn. These are stunning on, they are beautiful colours for summer and evening out. Different animal prints & gold/bronze/orange & pink. I just don't wear them so selling to make room. You would think they look designer!! They are gorgeous!!! 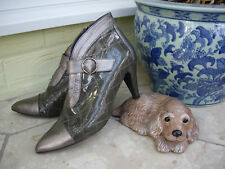 THIS IS A LOVELY PAIR OF PEWTER OR SILVER LEATHER ANKLE BOOTS / SHOES BY BALTARINI MADE IN SPAIN.THEY HAVE PATENT LEATHER QUILTED MAIN PART AND ARE LINED IN FABRIC. THEY HAVE BEEN WORN BUT NOT EXCESSIVELY AND ARE IN VERY GOOD CONDITION. Minette Stiletto Leather Ankle Boot Size 5. Beautiful patent leather in a colour that changes from black to deep purple so I would describe as blackberry. These are really expensive boots by NI designer Anita Flavin who also designs for luxury Italian design Ennio Mecozzi. They have patent leather upper with a suede top and beautiful pink leather soles. They are brand new and a bargain as they are just too tight for me as I am 5 1/2. They come from our clean, smoke and pet free home. See pictures for exact details. BDA Ladies Red Leather Calf Stiletto Pointed Toe Boots Uk 6 WORN ONCE !!!! Ladies Red Leather Calf Stiletto Pointed Toe Boots. WORN ONCE ! CONDITION AS NEW. MADE IN SPAIN. Stunning shoe boots never worn. Cream leather trimmed with black. Lining also leather. Made in Spain. Black Loslandifen boots with stiletto heel and side zip. Size UK 4 EUR 37. A couple of small marks from rubbing inside of box, 2 small glue marks. Ladies Black Stiletto Boots. Condition is New with box. Dispatched with Royal Mail 2nd Class (2 to 3 working days). Past Season Bourne Leather Boots Size 2 NWOB SP £210. Upper is leather embellished with a patent leather bow. Stilettos Ankle Boots Dispatched with Royal Mail 2nd Class. THE SHOES ARE NEW BUT HAVE A FEW MINOR FADINGS AS SHOWN IN THE LAST TWO IMAGES. HARDLY NOTICEABLE WHEN WORN. THESE SHOES ARE MUST HAVE THIS SEASON AND YOU SIMPLY CANNOT MISS OUT ON THEM. FASHIONABLE, AFFORDABLE, COMFORTABLE PAIR OF SHOES FOR YOUR FOOTWEAR COLLECTION.